You may have heard of Lagrangian points — they are five gravitationally stable locations around our planet, created by the forces exerted by the Earth and Moon on each other. They're a perfect place to put a satellite (and indeed we have). In this incredible model, you can see exactly where they are, and why. Of course, Lagrangian points aren't unique to Earth. They're created by any two objects with sufficient mass that are orbiting each other in space. Science fiction writers often use them in stories where starship pilots need a nice, stable spot to hover next to a planet or moon. Situating yourself at a Lagrange point is probably the closest thing you'll get in space to dropping anchor. The Lagrangian points are the five locations in an orbital system where the combined gravitational force of two large masses is exactly canceled out by the centrifugal force arising from the rotating reference frame. At these five points, the net force on a third body (of negligible mass) is 0, allowing the third object to be completely stationary relative to the two other masses. That is, when placed at any of these points, the third body stays perfectly still in the rotating frame. The first image shows the fields due to the first mass, the second mass, and the rotating reference frame. When added together, these fields generate the effective field shown in the second image. 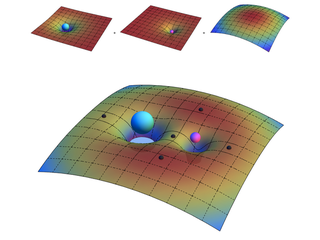 The five Lagrangian points are indicated with gray spheres. The first three Lagrangian points (labeled L1, L2, and L3) lie in line with the two larger bodies and are considered metastable equilibria. L4 and L5 lie 60° ahead of and behind the second body in its orbit and are considered stable equilibria.